Bio-Safe One Septic Tank Solution Review – How Does It Really Work? 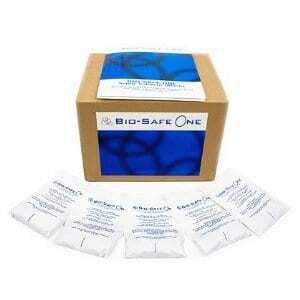 Does Bio-Safe One Really Work? The makers of Bio-Safe One say that it’s the most effective thing you can do to keep your septic tank clean and trouble-free. It would be great if it worked, because it’s easy to use and has a set-and-forget nature to it that would be very appealing, but does it? Septic tank owners are notorious for neglecting and otherwise not wanting to have to deal with the upkeep of their takes. Can you blame us? It’s downright nasty to think of what you’re having to deal with, and most of the time it’s easier just to call a professional if something goes wrong, but that can get pretty expensive. There are a lot of different products on the market that promise to keep things clean, but the one by Bio-Safe seems to be getting a lot of positive buzz surrounding it so we explored further. Bio-Safe One claims that it’s not enough to simply wait for your next pump-out if you want to keep things running as well as they can. In between pump-outs you’re going to end up with a messy situation on your hands, and many times the sewage ends up pooling up when it’s not supposed to, regulating that part of the yard as a no-go zone. They say, and back up with what appear to be user photos, that you can return that portion of your yard back to normal, with freshly growing grass and no mess to speak of. There has been a lot of people searching on whether Bio-Safe One actually works, so there must be a lot of traffic coming to their site for so many to wonder. What we’re seeing is that while some people might have noticed an improvement and saved on major treatments and repairs to their septic system, others are not so enthusiastic about their experience. This grey area is what bothers many would-be buyers and is something that many companies try to avoid. The cost is quite reasonable, considering that you can get a 22 month supply of Bio-Safe One’s B.O.S.S. for $140, and that’s if you have a new home. You can get a whopping 42 month supply for #200 if you have an older home. They also have sledge digesters available, as well as pre-established kits you can buy depending on the problem you’re having. They break down the treatment steps based on what sort of symptoms your septic tank has, as well as how old it is. You simply follow their treatment and maintenance instructions per your particular situation and you should be on your way. All of the steps are relatively easy, and don’t involve you getting up close and personal with the sewage, which is a big plus. This product is something that would be recommended for anyone that has a septic system, whether or not you’re noticing any signs of problems. It’s easy to maintain a relatively clean septic tank than it is to get a problematic one back under control. They say that if you are having to have pump-outs too often you’ll probably benefit from this, and save good deal of money in the process. You also may have noticed that your drains aren’t draining as quickly as they used to, or you can hear gurgling coming from your pipes. One of the worst things is when you start to notice that familiar smell creeping up, outside your home where it’s not so bad, but also inside your home where it can really effect your quality of life. If you’ve taken the step of having your well water tested and it came back positive for different types of bacteria, you should take action to get that resolved. You might also have seen that the water is starting to back up into the drains throughout your house. When things get really bad you may not even be able to use your water for things like flushing the toilet or even brushing your teeth or cooking. That’s when you know it’s high time to find a solution. Not to mention the unsightly way it can make your grass look off in your yard, alerting everyone to just where you drainfield is located. If you’ve noticed that you have a muddy drainfield, or that it’s started to flood up, that’s when things get really messy. Bio-Safe One is getting our Solid Try rating. The feedback on it has been positive enough to merit giving it a try at this price point. If it works for your particular situation you’ve found a very reasonably priced way to keep your septic tank clean and running smoothly, and could potentially save some serious dough by having to call for fewer pump-outs. If it doesn’t work as effectively as they claim, it will likely still have a positive effect. We couldn’t find any complaints of it worsening the situation, so the worst case scenario is that it only helps moderately. It’s important to take both preventive measures, and to deal with bigger problems as the occur. If you neglect the problem long enough it’s only going to fester until you won’t be able to tolerate the symptoms any longer. It’s better to just be proactive about what’s happening and take steps to get things under control, and then take the steps necessary to keep things going as you’d like them to. What do you think? Does Bio-Safe One work or not? Does Grout Bully Really Work? Does the Zero Germ UV Light Toothbrush Sanitizer Really Work? Yes, it definitely works! We built our home in 2001 and have used it every month faithfully. We’ve only had to pump one time in 15 years and that’s with a family of four! Well, did not work for me after giving Mr, Jorgensen about $4000. Novozymes is the manufacturer. Bio-Safe One is just a distributor, middleman. I have better results using products locally from my plumbing supply store. When I was trying to complain about this, his lawyer stared threatening me with a legal action. People are afraid of lawyers but, I have docs to prove that I am just providing facts so, there is nothing to be afraid off.